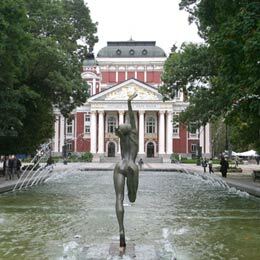 Bulgaria's National Theater Ivan Vazov with its 100 years of history is one of Sofia's emblematic cultural monuments. The City Garden in front of the theatre's renovated building has been a favourite place for walks and social meetings of Bulgaria's court and intellectuals in the past. Now the Garden is a gathering point for young and old chess players. The National Theater Ivan Vazov, named after one of our small Balkan country greatest literature classics, began its dynamic and rich life in 1904 when the dramatic troupe "Salza i Smyah" (Tear and Laughter) was renamed to Bulgarian national theater. Although it is no longer the only theater in the cultural reality of the country, the National Theater is a sacred institution for Bulgaria and Bulgaria's cultural life that has gone a long way and has faced many difficulties. Over the 100 years of existence the theater has faced one of the greatest difficulties ever - to retain Bulgaria's national and cultural spirit as well as values alive -not once or twice. Even now in times of globalisation and cross-cultural exchange, the theater remains one of the enlighteners in Bulgaria's reality. The beautiful building of the theater with a large stage that has 750-viewers capacity and a chamber hall that could house some 120 viewers is situated in the heart of modern Sofia and is now in great contrast to all the modernistic buildings surrounding it. Still, its grandness has remained unchanged over these 100 years of struggle. The construction of the grand building was assigned to the Vienna's architects H. Helmer and F. Felner that had a long history in the construction of Europe's most lively cultural centers at the time - Prague, Vienna and Odessa. The sources for the construction of the new theater house were collected for over 6 long years. The "house of the Bulgarian theater", as its admirers tenderly call it, was officially opened on January 3,1907. Executive director at the time was Joseph Shmaha but he was actively assisted by some of Bulgaria's greatest actors ever - Vassil Kirkov, Adriana Budevska, Krastyo Sarafov. In 1923 during a performance a fire breaks out at the stage and destroys the entire theater that is rebuild after 6 difficult years. After that misadventure the theater started its rise to greatness. Gifted directors present Bulgarian and foreign plays, a theatric school is also opened. It started building up contacts with foreign, Russian at first directors and actors, in that way enriching Bulgaria's cultural treasure. During the numerous guest-performances of the National Theater "Ivan Vazov" the world audience enjoys the theater's magic and applauds the talent of its actors and directors. World festivals such as BITEF 1999, the NET 1998 festival and others have also appraised the talent of the actors and directors of the National Theater. But, from now on, the struggle of the National Theater continues! It would have to prove mainly to Bulgaria's people that it remains the real home of the country's culture and spirit despite the difficulties it faces!